There is magic in mobility. Merri and I have been privileged to live in many places, Hong Kong, Germany, England, Isle of Man, Dominican Republic, and Ecuador, plus across the USA from Oregon to Georgia to California, Florida and North Carolina. Though I must express surprise at where the winds of fate have blown us, each journey has immeasurably enriched our lives and I was touched by the New York Times. As temperatures rise in Florida we are about ready to head north. We never know exactly when we’ll move. If you have been infected with the nomadic gene, you know what I mean. Bridge at our North Carolina farm. 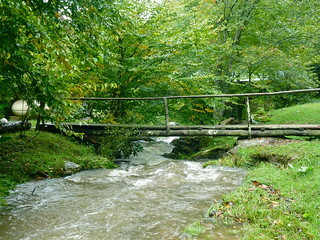 We love the Blue Ridge in the summer, the cool mountains, green forest and clear creek water running under our hand made bridge. That’s sort of like life… so many events… so many rich joys and so much water under the bridge. This is why I was touched by the New York Times article “Frances Mayes on the Lure of Southern Landscapes’ by Emily Brennan. Frances Mayes wrote an absolutely terrific book in “Under the Tuscan Sun” in 1997. We have crossed paths often as she was raised in Georgia, moved to California, then onto Italy, where she authored seven books about her life there. Then she moved back to North Carolina. So declared Frances Mayes, who returned to the South to live in Hillsborough, N.C., after decades of exile in California and Italy (the latter serving as a beguiling setting for several memoirs, including “Under the Tuscan Sun”). The article is about her new book, “Under Magnolia,” which poignantly recounts her upbringing in Georgia. This illustrates two important tips for nomads like you and me. The first tip is create a mobile source of income as Merri and I and Frances Mayes has. Whatever happens to the global economy… recession… depression… inflation… or expansion… if you can serve for a profit you’ll always be able to pay your way in the world. This is also so satisfying… doing what you love… being fulfilled and filling a purpose while getting paid for it. The second tip is “Don’t let water under the bridge leave you all wet or high and dry”. Many readers share with me their disappointment in the evolution of their country. This does not come just from Americans. Canadians, Australians, British and Ecuadorians and others write how fed up they are and with their nation. If you decide to leave your homeland… there is little wisdom in burning bridges… especially when not necessary. If you emigrate… do so in a way so you can return. This requires a bit of extra effort. Do it! Otherwise the costs can be high. Many readers leave their homelands expecting to never return. Never say never. Take Americans and their tax man as an example to see why. Americans must make detailed disclosures of non-U.S. investments annually to the IRS and U.S. Treasury even when they reside abroad. Do not let problems (such as unreported income to tax authorities) grow after leaving a residence behind. Don’t burn bridges. We never know where personal circumstances and events beyond our control will lead us! If you have been bitten by the nomadic blood, your life will truly be filled with riches. Mobility is magic, especially when each trip is left with a strong bridge so your next journey can take you wherever your destiny calls. Following the success of our recent SEO webinar, many people asked me about setting up their own website, and how much it would cost. How about $79? For a complete, SEO-friendly website. I am developing a webinar/training session – similar to our SEO webinar – that shows you exactly how to create your own website, in WordPress, in just 90 minutes. What’s more, I’ve now found a way that will allow me to do all the initial setup of your website at no additional cost to you. This means that you can literally jump right into working on your own website, without all the fuss of setting everything up.